What is the Great British Sewing Bee TV show? In The Great British Sewing Bee BBC Two TV programme dressmakers take on the challenge to become the best home sewer in Britain. Each week the contestants complete three sewing projects and try to stay in the competition. We are so excited that this iconic sewing bee series for makers will return to our TV screens. Why not catch up on what you missed in the last series? We’ve got a full run down for all the Great British Sewing Bee episodes, sewing pattern suggestions, sewing bee contestants, GBSB book reviews and much more from previous series! Who are the judges on the Great British Sewing Bee? 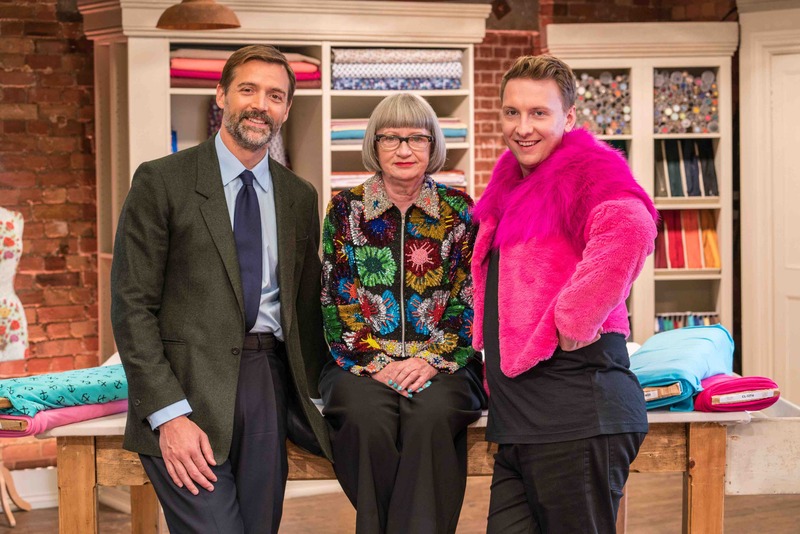 We first heard that The Great British Sewing Bee was about to go into production when it was announced in April 2018 that comedian Joe Lycett replacing Claudia Winkleman on BBC2. 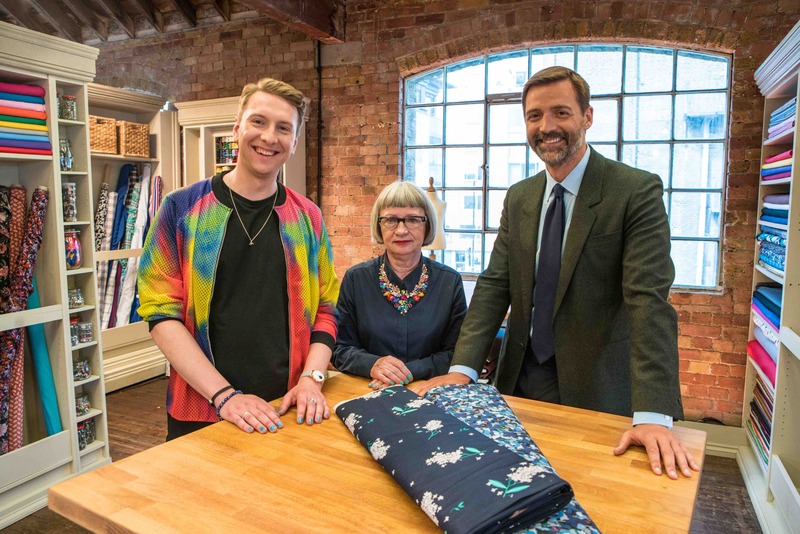 Comedian Joe Lycett now joins Saville Row’s Patrick Grant and Central Saint Martin’s Esme Young as a new host on the TV series. Patrick Grant is a British Fashion designer and works as a creative director for Norton & Sons and E. Tautz & Sons on Saville Row and Barbour. Patrick has been a judge on the show since the programme started. Since the sewing bee started, Patrick launched the social enterprise called Community Clothing to revive the British manufacturing industry. Find out all about this exciting project here. Esme Young was a new judge for series four of the Great British Sewing Bee, replacing May Martin. Esme studied at Central Saint Martins in London and also teaches pattern cutting there. She is well known costume designer and co-founder of iconic fashion label Swanky Modes. Her work includes films such as Bridge Jones (the bunny outfit!) and Trainspotting. 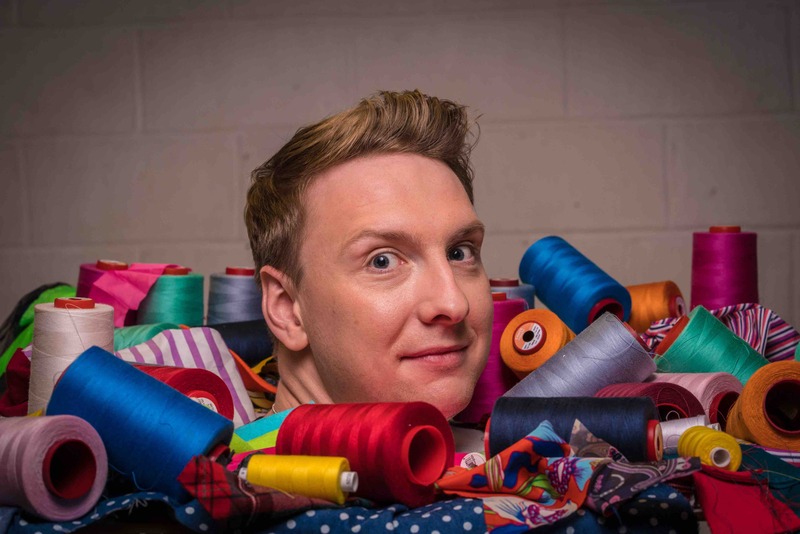 Joe Lycett is a new judge for series 5 of the sewing bee and replaces Claudia Winkleman . He is a comedian and has featured on shows such as 8 Out of 10 Cats, Celebrity Juice, Never Mind the Buzzcocks, Taskmaster and as a guest on BBC Radio. I think we can expect a lot of banter in this new series! When does series 5 of the Great British Sewing Bee start? 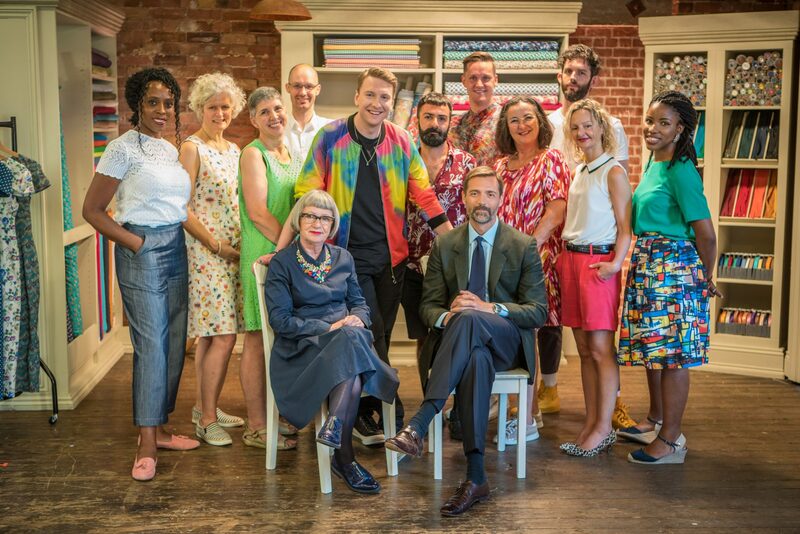 The Great British Sewing Bee opened for applications in April 2018 for the next round of hopeful contestants. Esme Young announced on her Instagram profile that Episode 1 of Sewing Bee Series 5 will air on Tuesday 12th February. Who are the sewing bee contestants? You can find out all about this year’s sewing bee contestants from the BBC BBC website, here are their details and where you can find them online. From left to right: Sheila, Jen, Mercedes, Alexei, Riccardo, Tom, Janet, Ben, Leah, Juliet. Alexei is 36 and a manufacturing engineer, living in Leeds. He only started sewing two years ago and attention to detail is important to his making process. 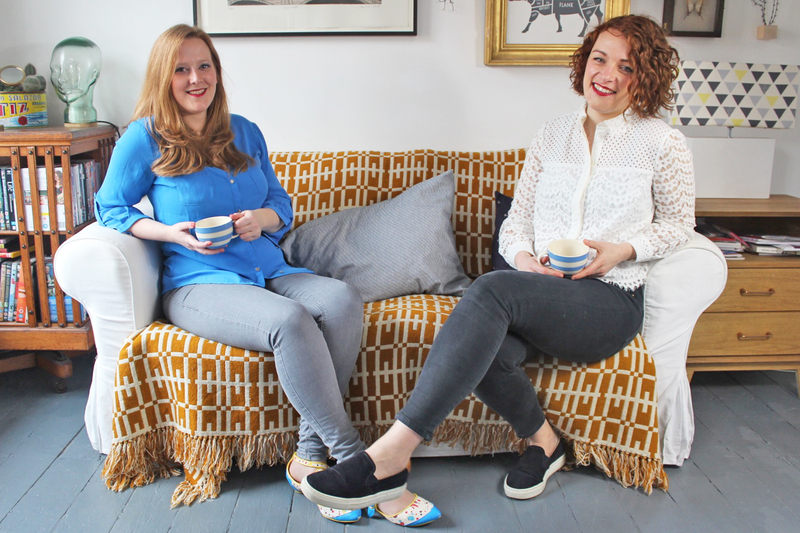 Where to meet other makers and chat about the Sewing Bee? We’ll be talking about every episode in our chatty Facebook group after the show has been on air each week. Come join the fun! We’ll also share on the blog sewing community events where you can meet up and talk about the show. Each week on the blog we will be sharing all the details of each sewing bee episode along with pattern suggestions. We will also be doing special sewing bee vlogs and newsletters. Visit our blog to keep up with all the details of each sewing bee episode and subscribe to our YouTube channel for special vlogs and newsletters. Sewing Bee Episode 1 – in the first week makers were using cotton fabrics. For their first sewing pattern task, they needed to make a ‘wiggle-style dress’, inspired by designer Christian Dior. A tricky start! The second challenge was to transform a garment, where contestants needed to turn three second hand denim garments into a new outfit. For the third challenge of the episode, the sewists fitted a jumpsuit to a model. What an opening episode this was! Find all the patterns featured here. Sewing Bee Episode 2 – in the second week makers were creating children’s clothes. The first task was to sew a hoodie with ribbing. The second challenge was to transform a garment, where contestants needed to turn faux fur coats into children’s fancy dress beast costumes. For the third challenge of the episode, the sewers fitted a dance costume to a model. Find all the patterns featured here. Sewing Bee Episode 3 – in the third week makers were sewing garments inspired by the 70s. The first task was to sew flared jeans with vintage sewing machines. The second challenge was to refashion plaid shirts into a punk outfit. The final challenge was to create a striking maxi dress using drapey fabrics. Find all the patterns featured here. Sewing Bee Episode 4 – in the fourth week contestants were sewing with technical fabrics. The first task was to make a lined swimsuit. The second challenge involved using discarded festival tents to create a dog coat. Finally makers were asked to create a luxury men’s tracksuit using fabrics such as scuba. Find all the pattern featured here. Where can I catch up on the previous series of The Great British Sewing Bee? We have loads of interesting blog posts, pattern suggestions, interviews and book reviews from the last series of The Great British Sewing Bee. Head over to read all about it here.